Throwing open the blinds or drapes is one of the delights of spring—but it can also be a signal that it’s time to deep clean your window treatments. A firm tug on your drapes or the strings of your blinds is sure to bring a scurry of dust in the bright sun. Spring cleaning your window treatments is a great way to banish dust and dirt. Always start by following any manufacturer’s instructions. Best for: Wood, faux wood, mini-blinds, vertical, and vinyl blinds. Vacuum Blinds: Use your vacuum hose with a soft brush attachment. 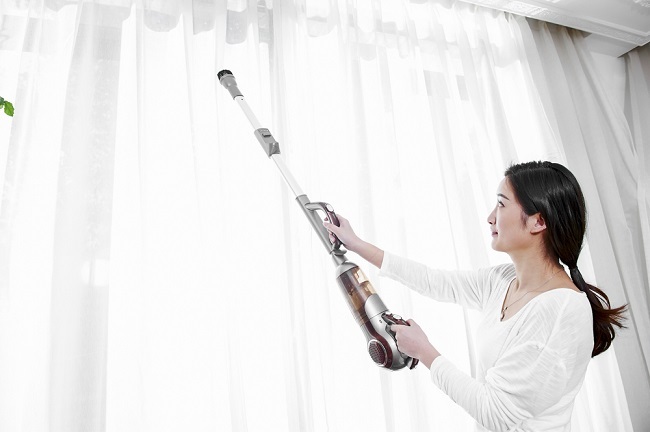 With the blinds or shutters closed, vacuum across moving downward so any falling dust can be easily vacuumed as you reach the bottom. Turn the blinds/shutters in the opposite direction and repeat the steps on the other side. Dust Blinds: Use a microfiber duster – one with “fingers” that fit between slats is especially helpful. Move it across the closed blinds, starting at the top. For vertical blinds, wipe from top to bottom. Reverse the blinds and dust the opposite side. Dry Clean Blinds: Some fabric blinds can be taken to a dry-cleaner. Check the label for specific instructions. Spot Clean Blinds: Got a mark on your blinds? Use a soft, damp cloth to gently blot the area. Best for: Cellular, roller, solar, woven, Roman, pleated, and sheer shades. Dust Shades: Use a microfiber duster to collect dust. Lower shades fully, then start at the top and work your way down. Vacuum Shades: Use your vacuum hose with a soft brush attachment. With the shades open, vacuum across working downward. For sheer shades, try dusting first – a vacuum’s suction may be too strong. If you wish to vacuum, proceed cautiously by placing a sock or stocking over the end of the vacuum hose so it can’t pull too hard. Test out the vacuum in a small corner of the shade first. A small handheld vacuum may also provide a gentler clean. Cleaning or spot cleaning shades: Vinyl shades can be cleaned with a damp white cloth. Try only water first, and wipe gently. Do not scrub or get them too wet. Dry with another clean cloth and leave in the down position until fully dry. If needed, a mild detergent can be added to the water. Be sure to rinse when you’re finished. Caution: There are many different fabrics used to make drapes and curtains, so you must be stringent in following the fabric guidelines. Cleaning/Washing Drapes: Look to see if your drapes or curtains have a tag like those found in your clothing. The tag should tell you if the product is dry-clean-only or hand-washable. If they’re washable, be sure to follow the tag’s directions exactly. If you don’t have a tag, assume they can’t be washed and take them to your dry cleaner for an expert opinion. Vacuum Drapes: Sometimes, curtains or drapes simply need a good dusting. Use your vacuum hose with a soft brush attachment. With the drapes open, vacuum downward. You can also put them in the dryer on the lowest heat setting. For sheer curtains, the vacuum’s suction may be too strong, so you may want to wash or dry clean them instead. However, if you wish to vacuum, proceed cautiously by placing a sock or stocking over the end of the vacuum hose so it can’t pull too hard. Test in a small corner before vacuuming the entire curtain. Should You Just Buy New Window Treatments? Are they safe? If you’ve got long strings that might be a choking hazard to a child or a pet, consider switching to cordless blinds to eliminate any potential danger. Are they in good shape? 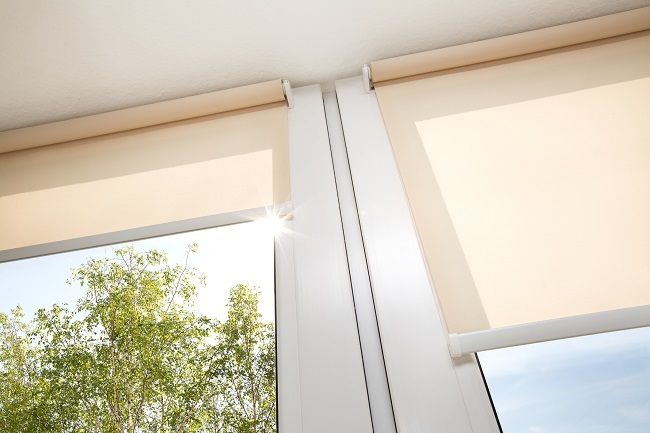 Sunlight and repeated daily use can wear out window coverings. If you’ve got any parts that are faded or need repair, it’s time for a new look. Are they in style? Window treatments naturally draw attention to themselves. Changing out blinds, shades, drapes, and curtains is a great way to start a mini-makeover for the room and bring a new style to your space. Are they “you”? Often, we inherit window coverings when we buy a house or rent a space. Now is the perfect time to upgrade to something that is more your taste. It’s an easy fix and a great way to renew your space this spring. Abigail Sawyer is the Senior Social Marketing Specialist for Blinds.com and a home improvement junkie currently restoring a 1972 cottage with her husband and Goldendoodle, Biscuit. Visit the Blinds.com website to find a variety of stylish window treatments to spruce up your home this spring.